Sen. Debbie Stabenow (D., Mich.) on Monday tweeted out an ad for her reelection campaign touting the support of a small business owner, but that same small business owner has praised the credentials of her Republican challenger, John James, to serve in the Senate. The ad highlights the economic impact of Arcadia Brewing Company in Kalamazoo, Michigan, and around the state. Tim Suprise, the founder of the brewery, explains how the craft beer industry affects the economy throughout the state, before the video transitions to Stabenow discussing how she wears her "Ag," or agriculture, and "small business" hats. "Senator Stabenow has really supported small business, and, as a small craft beer owner, that has mattered tremendously to us. We are the engines of economic growth," Suprise says. "We employ, as a percentage, more of the people as the large corporations, and it's a real privilege when you have a leader that steps up regardless of what side of the aisle they stand on or the real important issues that matter in our state." James soon responded to Stabenow's tweet with a video of Suprise praising his "leadership" and "experience." "Tim! We love Tim. We ran into him just last week," James, a combat veteran and businessman, wrote on Twitter. "Tim, a fmr. Reserve officer in the U.S. Army, said: ‘You need to look at the leadership, the experience, and I believe the kind of presence that we need in Washington, in John James for US Senate.'" "If you're paying attention to the United States Senate race for Michigan, you need to look at the leadership, the experience, and I believe the kind of presence that we need in Washington in John James," Suprise added. "As a former Reserve officer in the United States Army, I know that that kind of leadership is exactly what we need, not only for our representative in the Senate from Michigan, but for the United States. John James." Despite Suprise's praise, it appears that he has not endorsed either candidate. "We talked to him after he talked to Stabenow. He didn't explicitly endorse us," James' communications director, Ted Goodman, told PJ Media. Suprise's son, Gabriel, who has said that he supports James, said of his father: "I think Tim finds appealing aspects of both candidates for office, but I'm not sure he specifically endorsed one or the other." James has been closing the gap with Stabenow in recent weeks and is now within six points, according to a new Mitchell Research poll released on Friday. The poll shows James at 46 percent, and Stabenow at 52 percent. 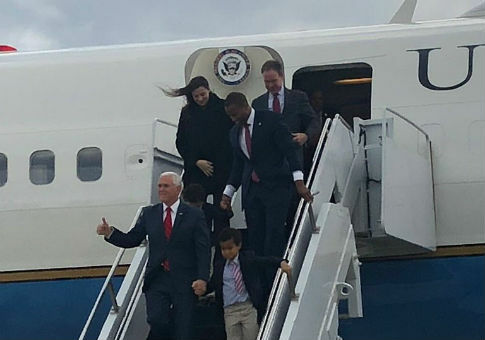 Vice President Mike Pence is scheduled to campaign with James on Monday evening. "Sen. Stabenow, a 43-year career politician with a million dollar home in Washington D.C., has only passed six bills despite receiving over $4 million from the taxpayers," James said. "Our message of economic opportunity, national security, and protecting the American Dream is resonating, and we are taking our movement to the floor of the U.S. Senate." This entry was posted in Politics and tagged 2018 Election, Debbie Stabenow, Michigan. Bookmark the permalink.